Many south Indians have switched to chapatti for dinner. Hence, dhal has become a 'regular' in our home menu. As always, we look for a change and tend to make different types of dhals to offer variety. 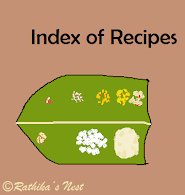 I have already covered six types of dhal on Rathika’s Nest. Here’s another type of dhal that mixes sweet and sour tastes in the same recipe. This dhal goes well with chapatti, roti or paratha. Traditionally tamarind is used to infuse sour taste in the dhal. But, I prefer to use raw mango, which provides a unique flavor and taste to the recipe. Let’s see how to make this yummy dhal. Method: Wash and pressure cook toor dhal with 2½ teacups (500ml) of water for 6-7 minutes (6-7 whistles). Once the pressure subsides, remove the dhal from the cooker and mash it very well with a ladle or hand blender. Keep aside. Wash the raw mango, remove the seed and cut the flesh along with the skin into medium sized pieces. Cook raw mango pieces with ½ teacups (100ml) of water in a kadai on low flame. Mango gets cooked very fast. Once the mango pieces are cooked, add the mashed dhal and mix well. Bring it to boil. Mix turmeric powder, coriander powder, cumin powder, red chili powder and asafoetida in ¼ teacups (50ml) of water and add to the dhal. Blend well. Now add in jaggery, salt and ginger. Reduce the fire and simmer for 3-5 minutes. Switch off the stove. Heat oil in a tadka pan or spice pan, add red chilies. When they turn darker in color, add mustard and cumin seeds. When they start to sputter, switch off the fire. Add the tempering to the dhal. Now add the ghee to the hot spice pan. Once it melts, add the curry leaves and sauté for a minute. Garnish the dhal with ghee and curry leaves. Serve hot with chapatti/roti, sabzi and pickle.